Powers/Abilities: Topaz is a powerful mystic with exceptional empathic abilities. She can drain hatred, fear, and evil out of others, or infuse living beings with life energy, such as causing a flower to grow in arid land. She can reunite disembodied souls with their bodies. She can sense the emotions of others as if they were her own, magnify or diminish the emotions of others, and heal the physical injuries of herself and others. She can communicate mentally with others over great distances, and she has proven able to control the werewolf Jack Russell's transformations. She can project psychic blasts powerful enough to stun other people or even demolish a tower. Her telekinesis is sufficient to break through steel bonds. Topaz can act as the familiar to sorcerers, enabling them to focus and magnify their magical powers through her own psychic abilities. (Official Handbook of the Marvel Universe, Update'89#7) - Not even Topaz knows her own origins; not even whether Topaz is her true name. BTS - Topaz adopted Caucasian form as a young girl, a form she maintained for most of her life, apparently believing it to be her own. (Werewolf by Night I#13 (fb)) - The young Topaz was taken to a prison camp in Punjab, India, where she was branded a witch after she made a flower bloom in the desert. After Taboo was imprisoned, he adopted Topaz as his ward. He had her use her powers to break them out of prison. (Werewolf by Night I#27 (fb)) - Through Taboo she met Glitternight, who tutored him in the mystic arts. (Werewolf by Night I#13 (fb) - BTS) - Topaz served as Taboo's familiar in the practice of sorcery. (Werewolf by Night I#13) - Taboo had his helicopter pilot, Jonathon, fly Topaz around and follow Jack Russell. When he transformed into wolf form, she used her powers to render him unconscious. Taboo's men brought the Werewolf back to his mosque, and when he revived Topaz led the Werewolf to Taboo, keeping him calm so that Taboo could better deal with him. Taboo had her read Russell's mind to learn the location of the Darkhold, but found that it had been seemingly destroyed by the mad monk Aelfric. Finding Russell now useless to him, Taboo ordered Topaz to kill the Werewolf. Topaz refused and he struck her down, vowing to force her to do it. Instead, she used her powers to transfer Phillip Russell (Jack's stepfather and Taboo's other prisoner)'s mind into Taboo's son, Algon, reviving him from his coma of twenty years. (Werewolf by Night I#14) - The misshapen Algon attacked the Werewolf, and Taboo again struck Topaz for refusing to obey him before. When the Werewolf returned to Russell at sunrise, Russell took Topaz hostage, trying to use her to force Taboo to call off Algon. Topaz again refused Taboo's order to slay Russell, and Taboo then threw her out of his home. Topaz accompanied Russell back to his Los Angeles home, but Russell went back to Topaz's mosque to try to recover his stepfather's soul. Taboo summoned Topaz's soul and used it to further empower Algon, but Taboo and Algon were both slain in the subsequent struggle with the Werewolf. Topaz's soul returned to her after Taboo's death. Topaz and Jack Russell flew to Transylvania to visit the village where his father died. (Tomb of Dracula I#18) - Topaz and Jack began a romance during their trip. Later when he became the Werewolf she kept him from rampaging out of control. The two were assaulted by Dracula, but the vampire lord found himself unable to gaze into Topaz's eyes. Dracula attacked the Werewolf, but Topaz calmed him. To learn his father's past, Jack and Topaz invaded Castle Dracula, leading to another confrontation with Dracula. When Topaz tried to calm him again, he swatted her unconscious. (Werewolf by Night I#15) - Topaz recovered and used her powers to drive off Dracula, enabling them to flee. Topaz opened Jack's father's locked diary and they learned of the origin of his familial curse. Dracula continued to plague the pair, but he was eventually driven off by Rachel van Helsing and Frank Drake. (Werewolf by Night I#16) - When Russell became the Werewolf in Paris, security guards seeking to protect her prevented her from keeping him under control. She pursued him, but was captured by the monstrous Half-Mad, though the Werewolf later rescued her and defeated Half-Mad. (Werewolf by Night I#17) - Topaz forced the Werewolf to turn back into Russell, enabling them to escape the police, and the two returned to Los Angeles. She noticed that her powers were progressively weakening, and she found herself unable to affect him as he battled the Committee's robot Behemoth. She decided to return to India to try to restore her power. (Werewolf by Night I#27 (fb)) - Topaz sought out Glitternight in hopes that he could restore her lost powers. Instead, Glitternight stole a portion of her soul, placed it within an egg-like structure of clear glass, and infused it with his own dark energies. Topaz passed out, awakening in a back alley, and finding Glitternight and all of his possessions having vanished without a trace. (Giant-Size Werewolf by Night#3 (fb) - BTS) - Nonetheless, Topaz regained her psychic powers in India. (Giant-Size Werewolf by Night#3 (fb) - BTS) - Topaz was captured by Maria Russoff in Transylvania who used herbal drugs and hypnosis to control her, forcing her to serve as her familiar. Maria used Topaz to reanimate dead Gypsies, sending them to murder villagers as her own Gypsy camp had been slaughtered by villagers in the past. (Giant-Size Werewolf by Night#3) - Topaz summoned the Werewolf to Transylvania, and after being freed, Topaz was able to restore the mad Maria's sanity, and Maria sacrificed her own life to save the Werewolf from one of her zombie Gypsies. As she died, Maria revealed herself to be Russell's grandmother; Topaz learned the tragedies that pushed Maria into insanity. (Werewolf by Night I#27 (fb)) - Jack and Topaz returned from Transylvania, staying in Buck Cowan's Malibu Beach house. (Werewolf by Night I#27) - Her powers proved insufficient to control the Werewolf, who followed the summons of Glitternight. He arrived to watch Glitternight transform Topaz's soul fragment into the monstrous Nightmare creature (left), which then attacked him. The Werewolf narrowly escaped and returned to Topaz and Buck, but all three were captured by Glitternight. The Nightmare creature died from its battle with the Werewolf and so Glitternight restored Topaz's soul fragment to his egg, reforming it as the Sin creature (right). The Werewolf destroyed that creature, too, and it reverted to the form of her soul and dissipated. As he fled, Glitternight told them that he planned to kill Taboo, leaving them both bewildered. (Werewolf by Night I#28) - Glitternight sent more creatures to assault Topaz, Buck, and Jack and Lissa Russell. After he again mentioned Taboo, the group went out to Blackgar Castle, where they found Taboo, who revealed himself to be just a soul fragment restored to a semblance of life by Glitternight. When Glitternight arrived and attacked them, Lissa Russell began to have her first transformation. Topaz and Taboo used their powers to try to keep her human, while Glitternight bathed in his own dark energy. The combination transformed her into a more monstrous were-demon. (Werewolf by Night I#29) - Topaz combined her powers with Taboo's and, with the aid of Cowan, they subdued Glitternight, though Taboo was left near death. (Werewolf by Night I#30) - Glitternight broke free and took control of the were-demon, but Taboo sacrificed his remaining life force, enabling Topaz to use it to restore Lissa Russell to normal and eliminate her curse. Glitternight was seemingly destroyed by the Werewolf. (Werewolf by Night I#31) - Topaz, Buck, and Jack and Lissa took a ski trip, during which time they met Elaine and Buttons Marston. The Werewolf went after Buttons, and Buck was nearly killed protecting her. (Werewolf by Night I#32) - Topaz comforted Jack after he learned what he had done. She and Lissa were confronted by Frenchie, the pilot/partner of Moon Knight, who had been hired to captured the Werewolf for the Committee. Frenchie wished to take Lissa hostage to ensure Jack's capture, but he didn't know which of the two women was Lissa. (Werewolf by Night I#33) - Frenchie took both women hostage, but Moon Knight ended up setting them free after learning that the Committee intended to turn the Werewolf into a warrior/assassin under their control. The women fled the result struggle when the Werewolf broke free and joined Moon Knight against the Committee. (WwbN#34 (fb)-BTS) - Belaric Marcosa somehow made contact with the comatose Buck Cowan, causing him to mention his name, thus leading a small group--Elaine Marston, Jack and Lissa Russell, and Topaz--to investigate Marcosa House. (Werewolf by Night I#34) - Topaz, Elaine Marston, and Jack and Lissa traveled to Marcosa House, but Topaz was quickly overwhelmed by Marcosa's evil and passed out. When she revived, she tried to reach out with her powers, leading to an apparent conversation with the werewolf spirit that possessed Russell. (Werewolf by Night I#35) - Topaz used her weakened powers to help Jack when he was seemingly attacked by his own werewolf spirit. Topaz determined that a succession of attacks against them were purely psychic assaults, or illusions, but they continued to be plagued by Marcosa and his ghost servants. Topaz was seemingly stabbed to death by Elaine. (Werewolf by Night I#36) - The psychic assaults continued, including a seeming demonic possession and reanimation of Topaz's corpse, but Topaz was soon revealed to be alive and well. Driven temporarily mad by Marcosa's attacks, Elaine actually did stab Topaz then, but only wounded her in the shoulder, and Topaz healed herself. Topaz then contacted Gideon Blaine, one of the spirits of the people murdered by Marcosa in the 19th century. Blaine led them to the entrapped spirits of Marcosa's other victims, but they were then confronted by the spirit of Marcosa himself, joined by his zombie army. (Werewolf by Night I#38) - Topaz observed a vision of the Three Who Are All. (Werewolf by Night I#39) - Topaz, Buck, and Jack and Lissa were joined by Brother Voodoo and werewolf Raymond Coker in investigating the visions they had shared. Topaz used her powers to subdue some of the false zombies Glitternight sent after them, after which she, Jack, and Brother Voodoo headed to Haiti to recover Coker, whom the false zombies had taken. Shortly after their arrival they were attacked by more false zombies, and were then confronted by Glitternight himself. (Werewolf by Night I#40) - Topaz assaulted the false zombies, but Glitternight then attacked and would have overpowered her had Brother Voodoo not thrown up a wall of fire between them. Nonetheless, both Topaz and Coker were taken away by Glitternight, who transformed Topaz into a monstrous creature that attacked Brother Voodoo and the Werewolf. (Werewolf by Night I#41) - Brother Voodoo helped shake Glitternight's control over Topaz and she managed to return to normal. She then assisted against Glitternight's monsters, while Glitternight was seemingly destroyed by the mystic entity Fire-Eyes. (Werewolf by Night I#42) - Topaz led the police to investigate a site being robbed by the Masked Marauder. (Werewolf by Night I#43) - Topaz left for Los Angeles after learning that Buck Cowan had vanished and his house burnt down. (Tomb of Dracula I#62 (fb) - BTS) - Traveling to Boston, Topaz was assaulted by a demon serving Mephisto (posing as Satan). It overwhelmed her powers and she passed out; she awakened in a house on "Satan Hill," dressed in a toga. (Tomb of Dracula I#62) - In Boston, Topaz summoned Dracula to save her from Mephisto. (Tomb of Dracula I#63) - Topaz and Dracula were joined by Frank Drake and Janus (Dracula's son), both of whom were summoned by Mephisto, and the four of them were transported to another dimension. 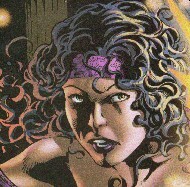 Topaz's powers proved to be too weak to affect their attackers. After Dracula apparently destroyed Mephisto's servant, Dracula and Topaz were transported to Hell and confronted by Mephisto himself. (Tomb of Dracula I#64/Official Handbook of the Marvel Universe, Update'89#7) - Mephisto revealed to Topaz that when she turned twenty-one, her power would be great enough to destroy Mephisto and to wipe away the evil of the world. Mephisto tried to destroy her before this could happen, but Topaz instead achieved full control over her power and unleashed mystical force that rent Mephisto asunder. Mephisto claimed that He (presumably the Christian God) had forced him to reveal Topaz's true potential, allowing her to realize it and destroy him. (Official Handbook of the Marvel Universe, Update'89 #7) - The demons of Mephisto overpowered Topaz and imprisoned her in his realm, while Mephisto himself eventually reformed. The demons also cast a spell over Topaz that would separate the empathic portion of her soul from her if she ever managed to escape their realm. (Fantastic Four I#276-277 - BTS / Dr. Strange II#75 (fb)/Official Handbook of the Marvel Universe, Update'89#7) - When Franklin Richards used his powers to scatter Mephisto's essence across the dimensions, Mephisto's realm of Hell was wracked with a cataclysm that freed the demonic entity in which Topaz was imprisoned. Topaz's soul fragment was "cast into the infinite" upon her escape. (Official Handbook of the Marvel Universe, Update'89 #7) - The extradimensional sorcerer Urthona found and captured Topaz's soul fragment. (Dr. Strange II#75) - The demonic creature containing Topaz made its way to Earth, drawing the attention of Dr. Strange, whose Amulet of Agamotto revealed that Topaz was contained within. Strange freed Topaz from the creature by immersing it in water, which destroyed its form, and both she and Strange soon realized that she was missing half of her soul. As such, Topaz not only lacked her empathic powers, but also control of her own emotions, resulting in her sanity becoming progressively less stable. (Dr. Strange II#76) - Topaz detailed the events leading to her current fate. (Dr. Strange II#77) - Topaz demonstrated her insanity by bursting into laughter upon seeing a man choking on television. (Dr. Strange II#78) - Dr. Strange prepared to start the search for Topaz's missing soul fragment via the Chamber of Extrospection, but they were disrupted by the chaotic magical energies unleashed by the Cloak of Levitation, which had been recently damaged by one of the Khats. Strange delayed the search while he took the Cloak to Enitharmon the Weaver. (Dr. Strange II#79) - Topaz wigged out while Dr. Strange was gone. Upon returning, Strange used a spell to send her into slumber to help her calm down. However, Topaz was awakened by Urthona, who appeared before her in a mirror in the Chamber of Extrospection, promising to restore her soul if she helped him access Earth. (Official Handbook of the Marvel Universe, Update'89 #7) - Topaz grasped Urthona's hand via the mirror, and Urthona used that mystic contact to create a spell that transported Strange's Sanctum to his alien planet. (Dr. Strange II#80) - Still seeking her soul, Topaz had to be stopped from walking out into the extradimensional chaos which had engulfed Strange's Sanctum, presumably a result of her assisting Urthona. However, the extradimensional warriors broke into the mansion and captured both Topaz and Wong, bringing them before Urthona, who taunted Clea with the missing soul fragment which was in his possession. (Dr. Strange II#81) - When Dr. Strange and his new ally (and future disciple) Rintrah arrived on Gevaltu. While Rintrah (at the time possessing Dr. Strange's body) shattered the bottle containing Topaz's soul, freeing it to return to her, restoring her powers. (Official Handbook of the Marvel Universe, Update'89 #7) - After Strange defeated Urthona, Topaz returned to Earth with Dr. Strange, Rintrah, and Wong. (Strange Tales II#1/2) - Topaz healed Wong from injuries received at the hands of Urthona, revealing she had come into her full power on that day, which was her 21st birthday. She then identified a darkness within Strange, related to his separation from Clea. However, despite Topaz's insistence that the only way he could heal was to reunite with Clea, Strange found himself unable to do so. (Strange Tales II#2/2) - Topaz continued to urge Strange not to turn his back on his love, but he left Clea anyway. (Strange Tales II#3/2 (fb)) - Topaz was present when Strange returned from his battle with a water elemental demon, during which time he had been forced to slay the demon's human host. (Strange Tales II#3/2) - Realizing Strange would not accept her help, Topaz left his Sanctum. (Strange Tales II#11/2 (fb) - BTS/Official Handbook of the Marvel Universe, Update'89#7) - Topaz was drawn to Britain by the Sisters of Glastonbury Tor, a mystic sisterhood that had cared for the gravely wounded King Arthur Pendragon after his final battle with his nemesis, Mordred. The Sisters instructed Topaz in the use of her great powers. (Strange Tales II#11/2) - Topaz appeared to Dr. Strange on Glastonbury Tor, offering to heal his soul of the darkness he had accumulated in the process of opposing the agents of Shuma-Gorath. However, Strange--encouraged by the black magician Kaluu--decided that he needed the power of black magic in the coming battle, and he refused her aid. (Dr. Strange III#2) - Topaz was sent by Gaea in response to a request for aid by Dr. Strange against Dormammu, who had usurped his body. Topaz located Strange, who had possessed the body of a rat, and then she joined his astral form and Clea in opposing Dormammu. Topaz used her powers to clear Dormammu from Strange's body as if he were an infection. (Dr. Strange III#6) - Dr. Strange sent Rintrah to recruit Topaz to retrieve and safeguard the body of Sara Wolfe, which had been abducted by Mordo who separated it from her astral self. (Dr. Strange III#7) - Topaz and Rintrah located Sara's body in a Metaphysical Institute and returned it to Strange's Sanctum. Topaz realized that Sara would soon die if not reunited with her astral self, which was imprisoned within a mystic sphere along with Mordo. (Dr. Strange III#8) - As Topaz and Rintrah tried to determine how they could reunite Sara's body and soul, they were confronted by Mephista, daughter of Mephisto, who sought to destroy the bodies of Sara and Mordo. Mephista overpowered the pair, but she was defeated by the returning Dr. Strange. Strange managed to free Sara and Mordo's souls and return them to their bodies, while Topaz used her empathic powers to reintegrate their selves as smoothly as possible. (Dr. Strange III#30 (fb)) - Fleeing the three-way battle between Strange, Mephisto, and Satannish, Mephista managed to possess Topaz, hoping to use this to make up for her failure inn defeating Strange before. Mephista's power prevented Topaz from recognizing the possession. However, unbeknownst to Mephista, Satannish had linked himself to her, intending to use her to access Mephisto's realm to later ambush his rival Hell-Lord. (Dr. Strange III#9/Dr. Strange III#30 (fb)/Dr. Strange III#10 - BTS) - Topaz was present as Strange expressed his frustration that Morgana Blessing had written a book exposing Strange as a sorcerer. Later, under Mephista's influence, Topaz returned to Europe. (Dr. Strange III#26 (fb) - BTS/30) - Mephista allowed Topaz to realize she was possessed, but duped her into believing the being possessing her was the degenerated Mesopotamian/Hittite god/demon Ullikummis. Topaz learned of a certain spell to exorcise the demon, which would require fire from a demon, the talon of a vampire in its bat form, and the fur of a werewolf. (Dr. Strange III#26) - Topaz returned to Strange's Sanctum, revealing she had been possessed, and requesting Strange's aid in acquiring the items she needed to perform the spell. She then accompanied Strange and Rintrah to Colorado, where they followed the trail of werewolf reports. They encountered the Jack Russell Werewolf, but they were all captured by the Possessors. (Dr. Strange III#27) - The Possessors took control of Strange, Rintrah, and the Werewolf, but weren't able to do so with the already possessed Topaz. She was imprisoned, but managed to detect Dr. Strange's spirit within one of the Possessors, and she helped Strange assert his will and free her. Strange banished the Possessors, and Topaz revealed she had acquired a handful of Werewolf fur. (Ghost Rider III#11 - BTS, 12) - Strange, Rintrah, and Topaz confronted the Dan Ketch Ghost Rider, assuming him to be a demon and intending to acquire some of his flame to help Topaz. This led to an encounter with the demonic Zodiak. (Dr. Strange III#28) - As Topaz tried and failed to acquire demon flame from the Ghost Rider, "Ullikummis" manifested itself, warning them of the risk of trying to cure Topaz. As Strange and Ghost Rider followed the trail of "Ullikummis" into the realm of the Dykkors, Zodiak overpowered Rintrah and then pursued Topaz. Strange and Ghost Rider returned in time to save her, and Strange revealed that he had acquired true demon-fire from one of the Dykkors. (Dr. Strange III#29) - After Strange healed Rintrah from the wounds he had received from Zodiak, Topaz revealed that "Ullikummis" was driving her mad, a fact she demonstrated by trying to romance Strange. She then accompanied Strange as they acquired the talon of a vampire in bat form from Strange's brother, Victor. Strange then used the three ingredients to perform the spell of exorcism, confirming his suspicions that it was not Ullikummis possessing Topaz, but rather Mephista. (Dr. Strange III#30) - Mephista tried to kill Topaz, but Rintrah saved her, after which Strange allowed Mephista to bind him and bring him into Mephisto's realm. (Dr. Strange III#36) - Alongside Morgana Blessing, Imei Chang, Clea, Dr. Druid, Rintrah, the Scarlet Witch, Victor Strange, Sara Wolfe, and Wong, Topaz attended a party for Dr. Strange for his part in saving the Universe during the events of the Infinity Gauntlet. (Spider-Man Unlimited I#20 (fb) - BTS) - Topaz came to run the Voodoo Lounge, a Greenwich Village bar frequented by those interested in the occult. 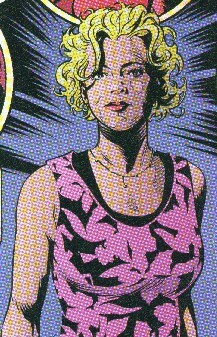 (Spider-Man Unlimited I#20) - Topaz was was sought out at the Voodoo Lounge by Hannibal King, who sought her help in locating the Amulet of Damballah. Topaz directed King to the young Collette, niece of Jericho Drumm (Brother Voodoo). (Dr. Strange: Flight of Bones#1) - Topaz's friend Wendy convinced her to visit New Age guru Jonathon White, who was actually a pawn of Dormammu. Prepared for Topaz, White used his powers, supplemented by the Underchild, to make her his servant. (Dr. Strange: Flight of Bones#2) - Topaz went for a walk with Strange, and they were attacked by agents of the Underchild and White. Strange flew Topaz to safety, but she then assaulted him, trying to kill him under White's command. Strange identified the mystic energy controlling Topaz and destroyed it, but Topaz was captured by White's agents. (Dr. Strange: Flight of Bones#3) - White infused Topaz with mystical power, telling her that she could either not use the power, and watch as he and his agents slaughtered Strange, or accept the power and use it to help him. However, once she used the power, she would be destroyed by it within 10 hours unless White himself removed it from her. Topaz accepted the power and helped Strange defeat White, his agents, and the Underchild, but then Underchild was then revealed to be a cover for Dormammu. (Dr. Strange: Flight of Bones#4) - Strange managed to disperse Dormammu back into the Underchild and cure all of his former disciples. Strange then tried to forced White to remove the mystic energy from Topaz, but found that it had to be surgically removed. Strange then possessed surgeon Keith Wilcott, helping him perform the surgery to remove the magic item and save Topaz. (Witches#1 (fb) - BTS) - Topaz became the disciple of Dr. Strange. At some point she returned to her true(?) Indian appearance. (Witches#1 - BTS) - Topaz, like most magic users, was wracked with agony when Andy Kale unwittingly unleashed the Hellphyr. (Witches#1) - Strange recognized Topaz as an agent "from above" to fill the requirement to contain the Hellphyr and safely reacquire the Tome of Zhered-Na. He then recruited Jennifer Kale and Satana for the other two requirements. (Witches#2) - Strange revealed the nature of the Tome, detailing that only a Kale, assisted by an agent of each Heaven and Hell, could defeat the Hellphyr and use the Tome. After Strange left, Wong conducted a training exercise for the trio. Meanwhile, Lilith (Mother of Demons) birthed a new lilin (her demon spawn) and sent it to attack the Witches. (Witches#3) - The Witches destroyed the lilin, but Jennifer and Satana got into a fight and Jennfier stormed out. She went to visit her brother Andy, who had transformed completely into the Hellphyr and who was joined by Satan, who had orchestrated his transformation. (Witches#4) - Topaz, Jennifer, and Satana arrived and assisted Jennifer in destroying the Hellphyr, killing Andy as well. Afterwards, the three Witches stood together against Dr. Strange, preventing him from taking the Tome from Jennifer. (Civil War: Battle Damage Report) - Tony Stark listed Topaz' status as undetermined. 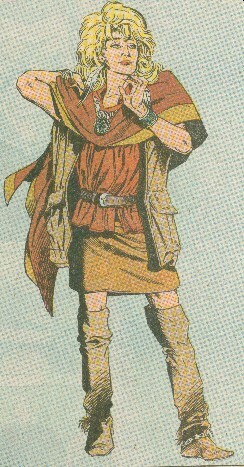 (Marvel Tarot#1 - BTS) - The First Tarot showed Ian McNee Topaz as the Temperance card. McNee commented that Topaz was more than an empath, healer or sorceress as she was kind and truly cared about others. (New Avengers#53) - The Eye of Agamotto appeared to Topaz as it considered her a possible replacement for Dr. Strange as Sorcerer Supreme. Comments: Created by Marv Wolfman, Mike Ploog, and Frank Chiaramonte. No explanation was given for Topaz's changing from Caucasian to Indian in appearance in Witches. Her behavior was much different and she appeared to be young, too, but so did all of the women in Witches. Nothing that was specifically contradictory to continuity, though. Per the OHotMU: It is unclear whether the half of her soul that Topaz lost on escaping Mephisto's dimension is the same portion that Glitternight had stolen. There is no documented incident before her captivity in Mephisto's dimension in which Topaz regained the portion of her soul Glitternight stole. It should be noted that after Glitternight stole a part of her soul Topaz did not lose her empathic powers or control over her emotions. It has been suggested that by removing the dark side of her soul, Glitternight unwittingly made her a more powerful force for good, and thus a threat to Mephisto. Kurt Busiek actually called Doctor Strange while he was battling Topaz in Marvel Age Annual#1! Anyone remember that?